On 16th of February, YIAGA brought together youths from all the states in Nigeria and trained them on community organising which was aimed at building a community of active citizens who will take responsibility to organise their communities to identify their resources and put them to use to achieve the result they desire even under uncertain conditions. I was part of this 3-days training that held on the 16th -18th of February 2017. The training focused on organisation as a leadership practice. “We will be doing something different within the next three days which will require you all to go beyond your comfort zone, you will be working as a team and please, you have to take the training with a beginner’s mind set.” Those were the words of Samson Itodo who is the Lead on the Not Too Young To Run campaign (NTYTR) in Nigeria. In his word, Samson also made a clear statement on the explaining “Theory of Change” when he said “In articulating the theory of change in organizing, one must first ask, why has there not been change over time on the issue you’re set to achieve” I said to myself, this is one of the most important questions to answer truthfully. NTYTR bill is a bill that has presently passed the 2nd reading in the National Assembly, it is a bill that seeks to increase the inclusion of youths in politics and governance. In Nigeria, 18 – 35 years is the youth age, and this age bracket makes up to 60% of the electorate. Also, it’s only from the age of 18 that any citizen of the country gets qualified to vote. There has been a long going argument that if a citizen at 18years is deemed old enough to vote, why can’t he equally be voted for, but presently, the law of the country won’t allow that. The NTYTR bill seeks to address this challenge to an extent by reducing the stipulated age limit for all elective positions in the country and allow for Independent Candidacy in elections. It is believed that this will further advance the development of the country if the bill succeeds. It’s noteworthy that African youths have been innovative, resilient and breaking grounds and their maker’s habit has wowed the world as they have consistently shown that taking responsibilities is not about age or experience. The time to get the NTYTR bill signed into law is now since the bill has received some support from the Legislature, but the steps in getting a bill signed into law in Nigeria is not a battle for the fainthearted. As the bill has passed 2nd hearing, it has to pass through the state legislative as well and it has to get the support and approval of at least 2/3 of the state legislatures in all the 36 states of the country. Though the process is lengthy and complicated, it is believed that it will pull through before the end of this year. In the three days training, we were grouped into five groups, with each focusing on different and specific areas of concentration or constituencies, but in all, towards organising and mobilising resources and people in support of the bill at the state level. In my group, we focused on Political Parties. We were trained on strategies on how to approach these people, convince them and how we can build a team of advocates at the state as if we are already on the project. Also, one of the most important aspects of the training is the organising which is defined as an adaptive form of learning that enable the constituencies (the People) to turn its resources into POWER it needs to achieve its goals or the change it needs to see. I was made to understand the importance of public narratives and how I can use my story to connect people to act by planning ahead and developing a strategy that will motivate people to act. In essence, what I learned here is more of how to use story-telling as a powerful tool for initiating change. I realised I have a story and know how to turn it to motivate people to act through the course of the training. Power is also a core part of the training where we are taught what power meant, it’s phases (Structure, Agenda, and Decision) and why power mapping is very important so as to be able to correlate interest and power in achieving meaningful and significant results. A good team must have all these steps for them to be a formidable and relevant team. Having seen some of these steps firsthand, I never knew there is a model (steps) to it. Thanks to YIAGA for the insight! 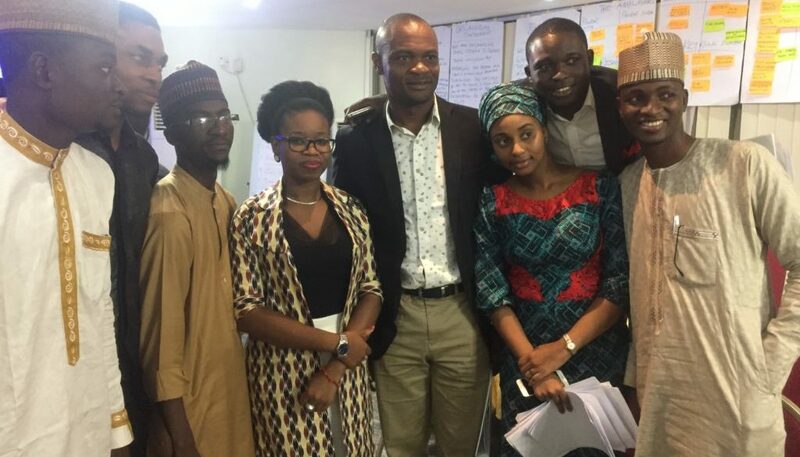 In all, organising is a major leadership skill and snowflake leadership model which allows for leadership to be distributed is what has been missing in Nigeria as a country and I look forward to more formidable team being formed through efforts of organisations like YIAGA and CODE as Follow the Money towards community building. Maybe one day, when more people become responsible and start acting, then we could have a country of our dream but it is not a battle of the fainthearted. I look forward to seeing more leaders emerging from the training and I am strongly convinced that the NTYTR bill will become a reality in Nigeria as this will help in giving youth equal access to be voted for rather than voting alone and maybe one day, we might have a youth as the president, Senate president or House Speaker in Nigeria.